Eventually the digital-memory bear market will end. The digital memory business is a cyclical one. Periods of sparse supply lead to higher pricing and profit margins for memory chip makers, followed by periods of over-supply where pricing and profits reverse course. As some Wall Street analysts predicted, a peak occurred in 2018, and memory stocks have been in retreat ever since. With share prices down sharply, some bargain buys have presented themselves for the new year. After all, the memory bear market always ends at some point, and buying a little bit at a time through the downturn can eventually lead to investment gains. Names worth adding to buy lists include Micron Technology (NASDAQ:MU), Seagate Technology (NASDAQ:STX), and NetApp (NASDAQ:NTAP). Micron is the largest semiconductor stock focused exclusively on memory chips. With a broad portfolio of products covering nearly every corner of the technology world, the company has done well since the last memory bear market reached its bottom back in 2016. However, while revenue continued to rise year-over-year during the company's first quarter of fiscal year 2019 (the three months ending Nov. 29, 2018), the next quarter is expected to yield double-digit year-over-year declines in sales and profits. That decline in sales would fulfill numerous analyst predictions of a memory chip downturn that were made over the summer of 2018. Though the warnings came half a year in advance, Micron's stock has fallen nearly 50% from its most recent high as investors anticipate leaner times ahead due to the up-and-down nature of the business. However, while still unclear on specific numbers, management said it believes it will return to growth by the second half of 2019, supported by renewed demand from industries including data centers and auto manufacturing. Results could continue to get worse before they get better, but Micron's stock has fallen so far that it is now trading at a price-to-book ratio of 1.1. 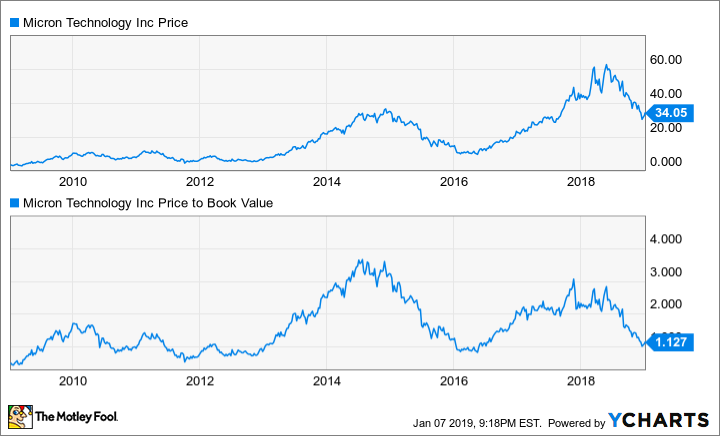 Though the business has wild swings up and down, a price-to-book ratio close to 1.0 has historically been a good indicator that Micron is a good value. Management thinks so too, as it commenced a new $10 billion share repurchase authorization during the first quarter. A hard drive manufacturer with an edge? Check out the latest Seagate Technology earnings call transcript. Much like Micron, shares of hard drive manufacturer Seagate Technology took a nosedive last year ahead of an expected slowdown. Since peaking in the spring of 2018, the stock is down nearly 40% even as sales and profits have continued to climb. During the company's first quarter of fiscal year 2019, sales were up 14% and adjusted earnings were up 77%. Historically, hard drive makers like Seagate made most of their money from personal computer sales, and that is still true. However, the company has also made headway in the data center industry and storage for other big enterprise uses as hard drives are still more cost effective to make than other memory types. Nevertheless, Seagate won't be immune to the memory industry's slowdown. During the second quarter, management sees revenues falling to $2.7 billion to $2.75 billion compared to $2.9 billion in 2018. Gross profit margins are also expected to be at the low end of the long-term 29% to 33% guidance. Though the cyclical swing for Seagate should be less than some of its peers, that near-term weakness is the reason for the stock's declines. However, with price-to-free-cash-flow (money left over after basic operations and capital expenditures are paid for) sitting at a mere 5.6, and Seagate's generous 6.6% dividend yield easily covered by that free cash, this stock is worth keeping an eye on. Check out the latest NetApp earnings call transcript. While NetApp is a maker of storage devices, the company is also a leader in providing cloud-based access to memory solutions. Big data and the analysis of it has grow in importance for business operations management in recent years, which has provided a tailwind for NetApp and its suite of managed services and hardware solutions. However, a big run for the stock in 2018 took a breather the last few months. During the second quarter of fiscal year 2019 (the three months ending Oct. 26, 2018), revenues increased 7% and adjusted earnings increased 33%. That's nothing to sniff at, but management said that results will decelerate sharply during the third quarter. Revenues could increase as little as 2%, and adjusted earnings as little as 13% compared with a year ago. Nevertheless, while its peers are in full-blown retreat due to the memory-chip bear market, NetApp is just experiencing slower growth. That underscores the power of investing in cloud-based services. However, NetApp is also the priciest stock on this list with a price-to-free-cash-flow ratio of 13.3. There is risk that NetApp's growth diminishes (or heads in reverse) if digital memory demand worsens. However, paired with a dividend yield of 2.7%, this stock looks like a good growth-at-a-value play. Digital memory stocks may have taken a sharp turn south on investors in the last year, but that's the nature of owning a piece of the historically volatile industry. Sooner or later, pricing will decline enough that demand will pick up and another run higher will ensue. In the meantime, nibble on these three a little bit at a time to spread out the risk of buying too high.